HUNDREDS of republicans from Counties Monaghan, Armagh and further afield gathered in Castleblayney to commemorate the 33rd anniversary of IRA Volunteer John Francis Green on Sunday last. John Francis Green was born in Lurgan, County Armagh, on 18 December 1946. He was an active member of the Civil Rights campaign in the late 1960s and later joined the IRA. He was forced to go ‘on the run’ following the introduction of internment in August 1971 but was arrested a few months later and interned on the Maidstone prison ship. He was later transferred to Long Kesh from where he escaped in September 1973. Following his escape he lived in the Monaghan and Castleblayney areas. On the evening of 10 January 1975, he left Castleblayney and drove to a farmhouse at Mullyash, where he had been staying. Just after he arrived there the farmer went off to tend to a neighbour’s cattle. When he returned he found his front door smashed in and John Francis dead at the bottom of the stairs. He had been shot several times in the head and body. His killers – widely believed to be a combination of British Army, UDR and unionist paramilitaries – left a number of live bullets on his chest. On Sunday a large crowd gathered on the Monaghan Road in Castleblayney. The march, though the Main Street was led by piper Paul Ford, the Cullyhanna Youth Band and the Burns/Moley Memorial Flute Band from Crossmaglen. The parade marched to the Keady Road where they gathered at the memorial that honours John Francis Green. The chairperson of the proceedings was Fintan Smith of the local John Francis Green Sinn Féin Cumann. The platform party included local TD and Sinn Féin Dáil leader Caoimhghín Ó Caoláin who was joined by Mid-Monaghan Councillors Jackie Crowe, James Cunningham, Mariea Kelly and Ballybay representative Gene Duffy. Mariea Kelly read the County Monaghan Republican Roll of Honour. Tom Green, brother of John Francis, then recited a decade of the Rosary. 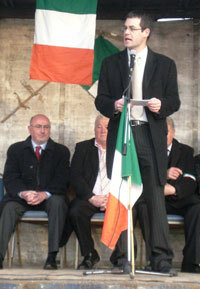 Senator Pearse Doherty gave the oration. Paying tribute to the Green family for their determination to expose the British state’s role in the assassination of John Francis Green, he said republicans will not rest until we achieve an Irish Republic.